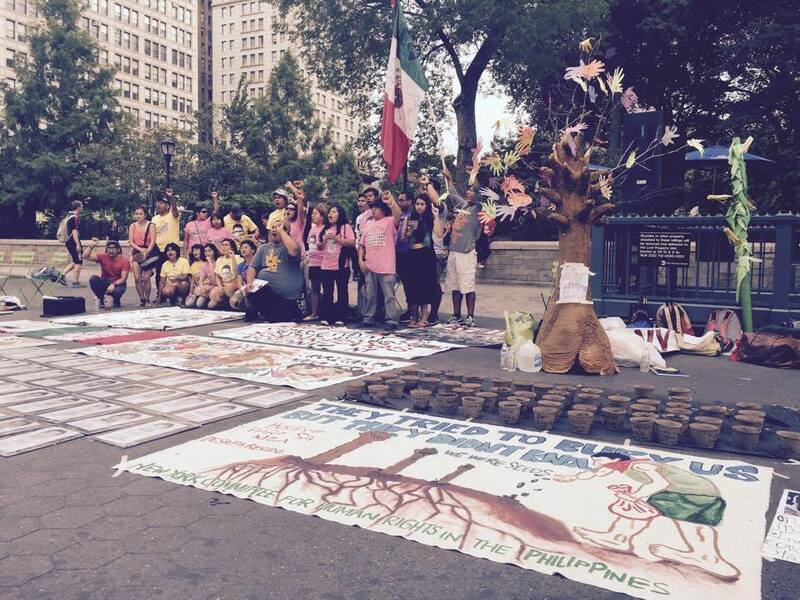 On August 30, 2015, the New York Committee for Human Rights in the Philippines (NYCHRP) staged a seed-planting ceremony in Union Square Park with Ayotzinapa NY, a network of Mexican activists who call attention to the horrendous kidnapping and massacre of 43 student activists in Mexico last September 26. The ceremony, called “Hustisya Para Sa Mga Desaparecido!” or “Justice for the Disappeared!” captured the sentiment of the quote “They tried to bury us. They did not know we were seeds.” This quote has been the rallying cry to resurface the Ayotzinapa 43. Forty-three seeds were planted in their memory. An additional 27 seeds were planted in the memory of 27 Filipino activists who were forcibly disappeared under the administration of President Benigno Aquino, including indigenous peoples who opposed large-scale mining projects that displaced them from their lands. 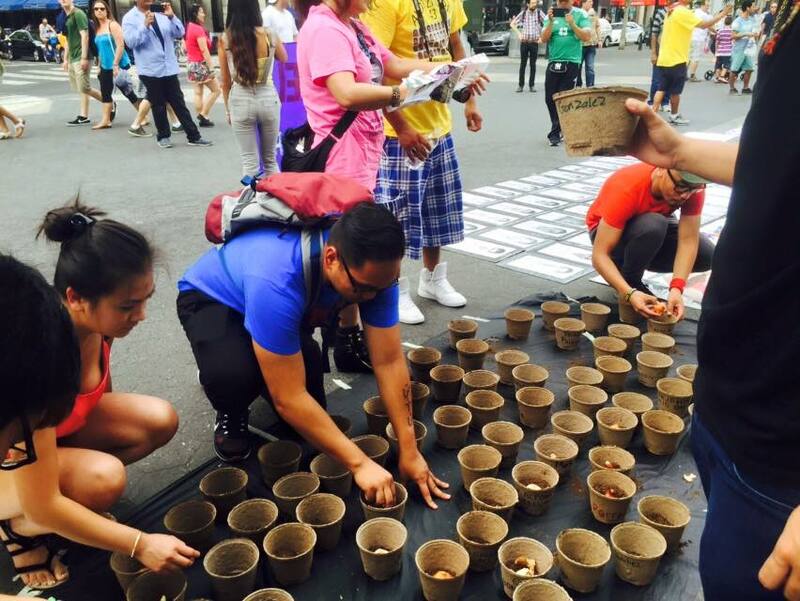 The seeds symbolize the struggle for basic human rights that the disappeared had sown. The action was joined by other allied organizations and passers-by who were invited to take a planted seed home and care for the seed as one would nurture the movements that the disappeared had advanced. 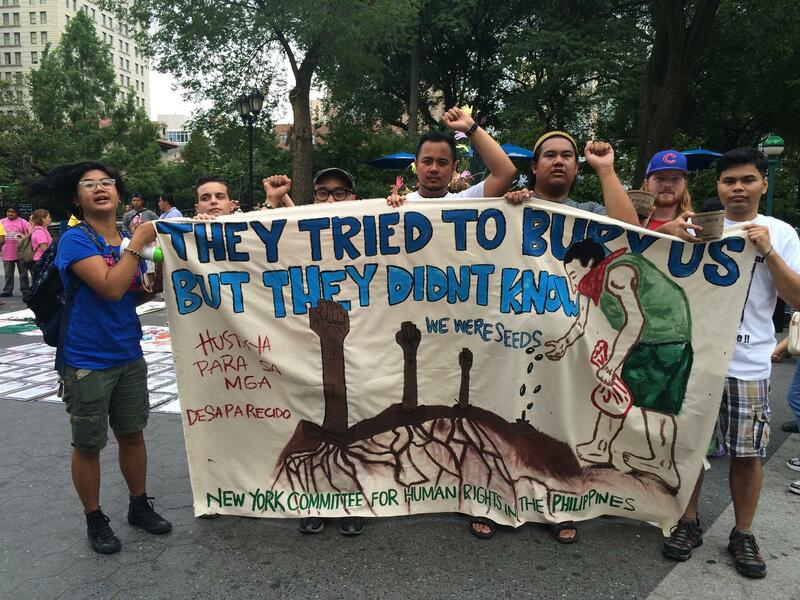 NYCHRP educates, organizes, and mobilizes about the root causes of human rights violations in the Philippines, namely feudalism, U.S. imperialism, and bureaucrat capitalism. We forge solidarity with others who are directly affected by these systems. 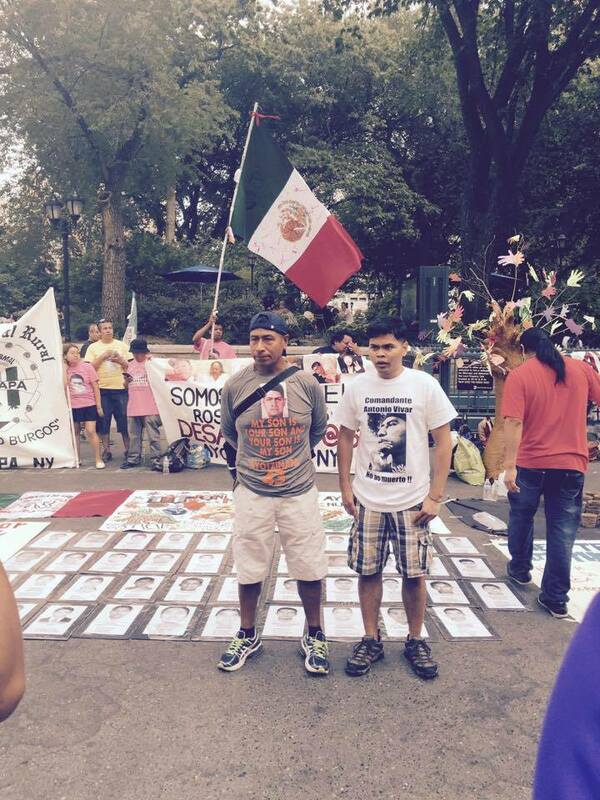 It is this solidarity that has allowed NYCHRP to find natural allies within Ayotzinapa NY. 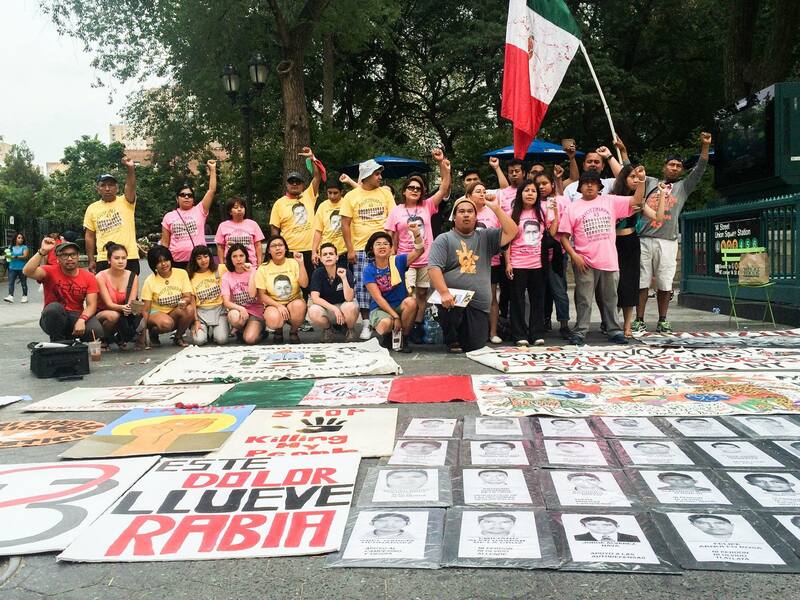 From the Philippines, to Mexico, to New York City, the crisis of enforced disappearances pushes us to grieve together from the loss of our loved ones, and to build power within our communities to continue their fight. Neoliberal and neocolonial forces endeavor every day to divide, depoliticize, decontextualize, and demobilize our shared history and struggle. But we know better. We know that our context, our history, and our continued struggle against modern forces of oppression binds us together today. Our shared struggle begins before the formal inception of our respective nation-states. Since the 16th Century, at the dawn of Spain’s development as a capitalist economy, Spain sought to extract and exploit the land, the resources, and the people of the Philippines and Mexico to feed the increasing greed and avarice of its growing bourgeoisie, and to serve its utter dependence to more advanced and insatiable capitalist societies at the end of the Middle Ages. As a result, our peoples fought for centuries against colonization, against the pillage of our homes, against the murder and abuse of our families, and the theft of our land and our heritage. We remember that the Philippines and Mexico succeeded in ousting one colonizer. We declared our independence from Spain on the backs of our brave peoples, but our struggle continues. Today we are facing the most modern form of colonization in the form of imperialism. Neoliberal policies, directed by imperial powers like the United States, continue to threaten the dignity and rights of our people every day. In Mexico, the North American Free Trade Agreement (NAFTA) has wreaked havoc on Mexicans since the early 1990s. The surge of American subsidized farm products put many Mexican family farmers out of business and forced to find other jobs. Subsidized American corn became simultaneously overabundant and overpriced, affecting the people’s ability to afford their staple food such as corn and rice. Up to 20 million people faced food poverty as a result of NAFTA. Manufacturing, which became the hedge for fulfilling NAFTA’s promises for more jobs in Mexico was exploitative to Mexican workers, many of whom had recently been ousted out of their self-sustaining roles as farmers for their families. The maquiladoras squeezed every ounce of dignity of every Mexican laborer who worked there. As a result of abusive job prospects at home and the inability for many to return to live off of farming for themselves, an influx of migrants looking for work came to the US and were stigmatized, criminalized, and abused in the immigration system while corporations profited off of cheap labor and abandoned farms. NAFTA has so far only profited corporations and the wealthy elite, who have replaced family farms with large industrial farms, extracted the labor off of Mexicans and migrants while holding the leash to eject them at any moment with unconscionable employment contracts and an unjust immigration policy. In the meantime, the life, dignity, and human rights of the Mexican people continue to suffer. In the Philippines, the Trans Pacific Partnership (TPP) threatens to do the very same and worse. The US, along with other States, is conspiring behind closed doors to lord over the fate and welfare of the Filipino people. Currently, few members of the public or the government on both sides of the Pacific Ocean have access to the details of TPP, but hundreds of corporate official advisors are handling it day to day. TPP is being touted as a driver of an economic miracle, but what it aims to do is to subsume the power of our governments to the whims of profiteering corporations and rip apart what little protection is left for our rights. The TPP has provisions that affect food safety standards, internet privacy, jobs, the environment, and access to medicine. More alarmingly, the TPP, in an attempt to strengthen the trade agreements that came before it, will allow and possibly strengthen corporations’ abilities to sue national governments for losses on their expected profit – an amorphous number known only by the corporations – directing the priorities of our governments away from the people and more for the unjust enrichment of already very rich and very powerful multinational corporations. NAFTA and TPP are only two of many neoliberal policies that put our very lives, dignity, freedom, and human rights at stake. Who is there to fight for us and to defend our dignity and human rights but ourselves? We recognize this shared system of oppression, and through this we grow in solidarity as our struggle unites us as one people with a strong voice that defends the welfare of our people. It is for this reason that our comrades have fought and raised their voices to defend and protect human rights. As a result, the oppressive Mexican and Philippine governments endeavored to silence them and to divide us by abducting, kidnapping, and taking away our friends and families to places where we may not know of even today. International tribunals have been organized by people’s organizations to hold both the Mexican and Philippine governments accountable for their human rights atrocities. The first tribunal was held in Washington DC on July 16-18, 2015, where dozens of witnesses and victims of human rights violations testified in a court of public opinion that resulted in a guilty verdict against the Philippine and US governments for their involvement in thousands of violations against the Filipino people’s political and civil rights, economic and cultural rights, and their right to self-determination and liberation. Another tribunal will take place on September 25-26, 2015, in New York City on the anniversary of the disappearance of the Ayotzinapa 43 to prove the Mexican government’s involvement in thousands of similar human rights crimes. These tribunals are a result of the people’s continuing clamor for not being able to attain genuine justice through unfair judicial systems. More importantly, they are a practice of the people taking justice into our own hands to deliver the true verdicts against human rights perpetrators. We seek accountability from our governments for these disappearances. Antonio Tizapa, the father of Jorge Antonio Tizapa Legideno who is one of the missing 43, urged the attendees of the action to demand the U.S. government to stop sending military aid to the Mexican government because these resources are used to carry out enforced disappearances like his son suffered. Likewise, the U.S. government sends $50 million in military aid to the Philippines annually with the same result, the disappearances of our families, friends, and comrades. Thousands of others are still missing in Mexico and in the Philippines. It is a reminder for us to never give up hope. We should not relent to neocolonial and neoliberal forces that attempt to constrict our human rights and dignity. We must fight against imperialism. We must fight against NAFTA and TPP. We must fight to grow the seeds sown by our disappeared for a society that defends and protects the people from human rights abuse and exploitation. We must continue in their struggle and fight for justice for the desaparecidos. Alive they took them! Alive we want them back! The people united will never be defeated! Ang tao, ang bayan ngayon ay lumalaban! El pueblo unido jamas sera vencido! New York Committee for Human Rights in the Philippines (NYCHRP) is a local education and advocacy group based in New York City that works to promote social, economic, and political alternatives that foster democracy and peace based on justice in the Philippines and for Filipinos in the diaspora today. NYCHRP shares the vision of human rights advanced by the National Democratic movement of the Philippines. NYCHRP educates, organizes, and mobilizes people and communities in NYC to take progressive action in upholding and supporting human rights in the Philippines and throughout the world. Antonio Tizapa (left), father of one of the Ayotzinapa 43. NYCHRP, Ayotzinapa NY, and other community members. Previous Post Filipinos Unite in front of the United Nations to Save the Life of Mary Jane Veloso!